More than 530 air weapons have been surrendered in the north east as part of the national air weapon campaign, the highest number of any division in Scotland. The Air Weapons and Licensing (Scotland) Act 2015 comes fully into effect on December 31. The new law will require any person who possesses, purchases, uses or acquires an air weapon to have a certificate to hold them legally. It will be an offence not to have a certificate for these purposes from December 31, unless you are exempt, but from July 1, you will be able to apply to Police Scotland for a certificate. 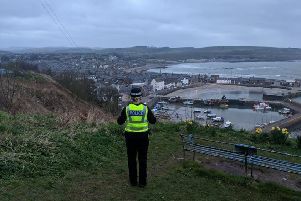 Queen Street Police Office, Queen Street, Aberdeen; Nigg Police Office, 230 Abbotswell Crescent, Aberdeen; Mastrick Police Office, Greenfern Place;Inverurie Police Office, Blackhall Road, Inverurie;Fraserburgh Police Office, Finlayson Street, Fraserburgh; Stonehaven Police Office, Dunnottar Avenue, Stonehaven; Banchory Police Office, High Street, Banchory; Ellon Police Office, Bridge Street, Ellon, and Huntly Police Office, 11 Castle Street, Huntly. For further information, please see www.scotland.police.uk/airweaponsurrender. The three-week surrender campaign runs until Sunday, June 12.